Following TRAI's new framework for broadcasting and cable services, DTH operators, as well as cable TV distributors and multi-system operators (MSO) including Airtel, Hathway and more, have put out pricing for individual TV channels. Airtel Digital TV has segregated its lists into a-la-carte and combo packs with different pricing lists for High Definition and Standard Definition. Following TRAI’s new framework for broadcasting and cable services, several DTH operators as well as cable TV distributors and multi-system operators (MSO) have put out pricing for individual TV channels. This includes major DTH operators, Airtel Digital TV and Dish TV. 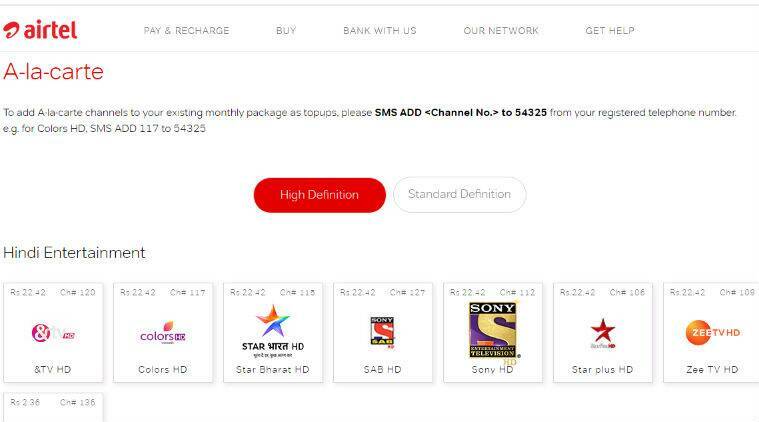 While Dish TV has put out its entire list of channel along with individual prices, Airtel Digital TV also offers combo packs that users can choose. As per Telecom Regulatory Authority of India’s (TRAI) new framework, users can individually select and pay for channels they want to watch per month. Consumers have till January 31, 2019 to select TV channels of their choice, though the earlier deadline was December 28, 2018. Airtel Digital TV has segregated its lists into a-la-carte and combo packs with different pricing lists for High Definition and Standard Definition. Users can choose from Hindi Entertainment, English Entertainment, Music, Sports, Kids, Telugu, Malayalam, Marathi, and more categories from the bouquet. The listed pricing is monthly for a period of 30 days. For a-la-carte packs, subscribers will need to recharge with a base pack worth Rs 150. 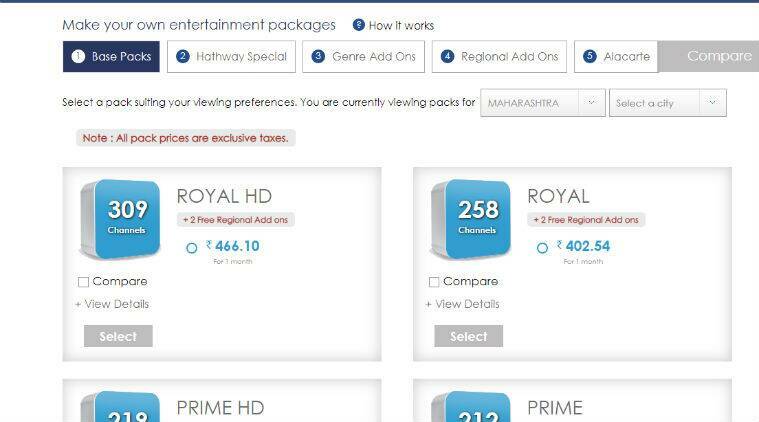 If one goes by a-la-carte, major Hindi HD entertainment channels like Star plus, Sab, &TV, Star Bharat, Zee TV are priced at Rs 22.42 each per month. English movie channel packs differ in monthly pricing, with the most affordable Le Plex at Rs 5.90 and &Prive along with Zee Studio at Rs 22.42 each. Cable operator, Hathway has similar channel packs that can be chosen in a-la-carte basis or Hathway Special packs. Several HD as well as Standard Definition combo packs that club several channels are listed as well. For instance, Airtel’s Magic HD ROI Topup is priced at Rs 93 per month and it includes channels like Star Plus, Star Gold, Zee Cinema, Sony, National Geographic, Starr Sports HD2, Discovery as well as certain Bengali and Marathi channels. DishTV users can find channels segregated under Business News (English), Infotainment HD, Hindi movies, Kids, International, Lifestyle/Fashion, and more. The pricing ranges from 0.1 paise to Rs 19. In addition, different packs from broadcasters are also a part of the list. DishTV has priced Star Plus and Colors at Rs 19 each. Sony, Sab HD, Star Movies HD have the same price. Max HD is priced at Rs 17, while Star Sports 1 HD (Hindi) and Star Sports Select HD2 can be bought at Rs 19 and Rs 10 respectively. Den Networks has also put out its list of monthly pricing for bouquet of channels that go up till Rs 130. Star India packs include Telugu Value pack, Hindi HD Premium, and more, while those from Times Network are Times Bouquet 1 HD, Times Bouquet 2 HD. More channel packs from Turner International as well as Sony Pictures Networks are listed as well. Cable operator, Hathway has similar channel packs that can be chosen in a-la-carte basis or Hathway Special packs. In addition, Hathway has listed its base packs with channel lists as well as add-on packs. 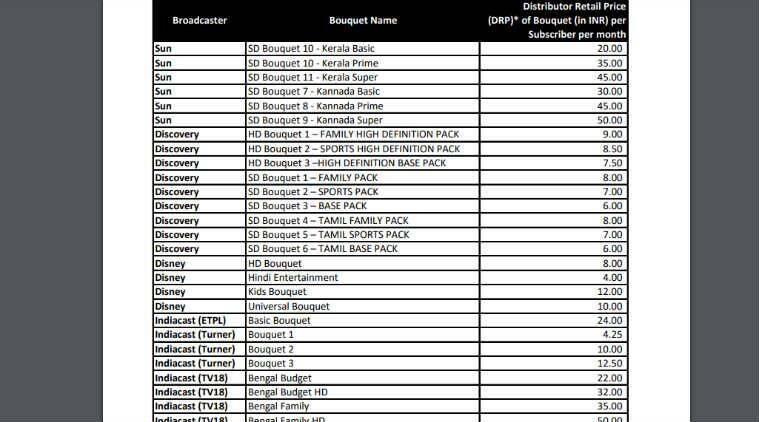 Den Networks has also put out its list of monthly pricing for bouquet of channels that go up till Rs 130. Another such player is Siti Cable that has five channel packs to choose from. The channels that have pricing as Rs 0 against them will be included in the free-to-air channel pack that every user will need to subscribe to at Rs 130 plus taxes. 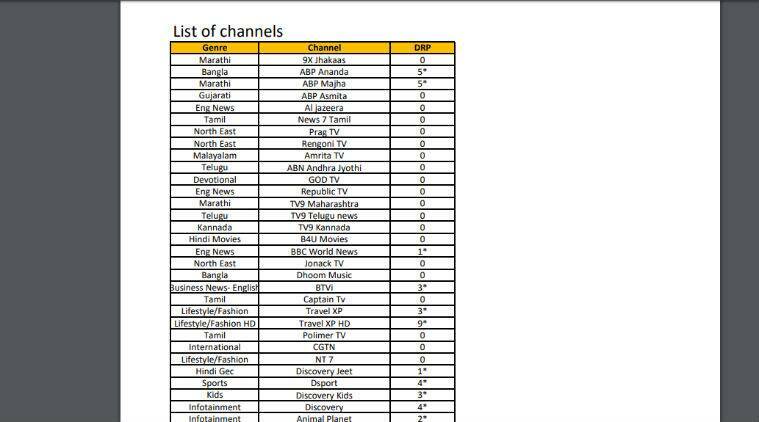 Subscribers can select 100 free-to-air channels from around 500 channels. All users will need to subscribe to this base pack, as per TRAI framework.